The eyes will see the first light only when knowing has shriveled to an empty husk. When the vicissitudes of life come to an end, so do glad tidings. How can a human being duly discern clarity amid confusion? Today marks the end of the winter retreat. The first day trickled into a month, which quickly flew by, and suddenly three frigid wintry months have passed. How come not one of you has come to see me to demonstrate the true courage of a hero throughout this retreat? It is because you frittered the days away, lost in useless thoughts and delusions, in dullness and lethargy, and because your mind has not yet thoroughly and resolutely latched onto the single thought of your hwadu or critical phrase. It is time for all of you to reflect on how sincerely and singularly you have doubted your hwadu and held it in your mind for the past three months. If your mind is not sufficiently cultivated to be completely focused on one point, or if there still remains the slightest sense of “I”, even as much as one-thousandth the width of a human hair, you will never see your true nature and pass through the Gate of Truth. When the mind is steadfastly focused on the single point of your hwadu, suddenly upon hearing a single sound, or seeing a single sight, the hwadu will shatter, bringing down the Great Mountain itself, and your mind will be for the first time wide open to the world of truth. In order to reach this state of single-pointed focus, you must be free from any attachment to the body and let go of all discriminating thoughts, including any concept of right or wrong. You must do this ardently and desperately hold your hwadu, whether your surroundings are serene or noisy, and whether you are coming, going, sitting or lying. You must do this to the point that the whole quagmire of illusory habits and conditions completely vanishes. Therefore, everyone here will have to continue to pour body and soul into achieving this state of mind, whether it is the retreat season or not. China’s Tang Dynasty was the golden age of Chan Buddhism when the five major streams of the Southern School of Chan were established. Yunmen Wenyan (雲門文偃), the founder of the Yunmen School, became a monk at an early age, and his faith was so devout and his resolution so deep that he was ready to sacrifice his life to attain enlightenment. After Master Yunmen received the teachings from the enlightened Master Muzhou, his eight eyes of enlightenment opened, and after joining the Dharma assembly of Xuefeng Yicun (雪峰義存), he finally conquered the great matter of life and death. Consequently, he received the transmission from his teacher and became his Dharma-heir. What is the Buddha’s Path? What is the true tradition of Kanadeva? What is the hair-splitting sword? “Coral branches prop up the moons,” to the third question. Full of joy upon hearing these answers, Master Yunmen declared to his students, “Do not prepare food for the anniversary of my entering parinirvana after I die. Instead, mark the day every year by sharing and reflecting upon Haojian’s three answers. Many so-called teachers these days, often admired as enlightened, hesitate when faced with the pivotal moment of Dharma exchange because they have neither attained the correct views nor cultivated the correct mind-ground of the ancient sages. The truth of the unfathomably boundless Buddha-dharma can be digested only if each and every teaching of all the past masters is correctly studied and understood. It is simply unthinkable that your life will be even the slightest bit different from that of the Buddhas and Patriarchs if you have really seen your true nature because to see one’s true nature is to fully and completely realize the mind. How can your mind differ from the fully enlightened mind if you have truly seen your true nature? If there is any difference, it can mean only one thing; that your wisdom eye is not open yet. 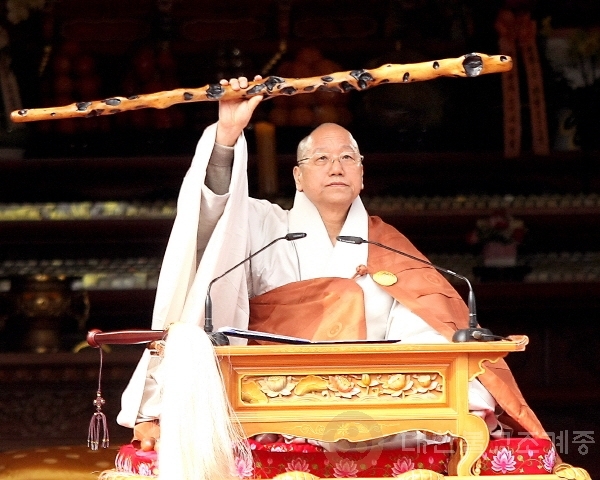 Countless masters preceding us have spread a sumptuous feast of gongans, defeating and destroying all obstacles. Those gongans are the result of their enlightened minds flowing into an infinite number of manifestations, unapproachable by cunning and craftiness, and unobtainable by discursive knowledge and intellectual thinking. Unless you achieve infallible certainty through all those gongans, thus opening wide the world of truth, you cannot hope to embrace the great mind-ground of reat the past masters have cultivated, or attain the lofty state of mind they have realized. Therefore, the practice of all true spiritual seekers must be firmly rooted in the fruits of Dharma reaped in the past, completely penetrating the infinitely overlapping and interwoven net of gongans. Therefore, if you fail to display an eloquent command of this One Phrase perfectly and effortlessly you have no business in guiding sentient beings on the Path. Furthermore, all you can teach is ignorance which is harmful and dangerous to the world; the numinous state of mind that ancient sages attained is completely out of your reach, not even attainable in your dreams. If you truly understand the three cryptic responses of Haojian, you deserve to become a lineage holder. If you would like to offer the One Phrase, please come forward. So Assembly, what is the Final Phrase of Truth? The bright moon floats on the water.